We have a spectacular week of Homecoming events for our Crusaders this year, including Dress-Out Days, Talent Night, Pre-Game Tailgate & Football Game, Reunions and Students' Homecoming Dance. All Alumni, TC Families and friends are welcome at the Tailgate Friday night. Come meet your classmates from '68, '78, '98 & '03 as they join us Friday night at the cook out. Check out all the information below and make it a point to COME HOME to ROME - Tampa Catholic - this year! Join our students, alumni, parents, families & friends for these featured events! A Very Special Night of Crusader Talent hosted by TheaterTC. This year our TC Talent Night is TC Cafeteria. Get your tickets early as seating is limited for this, one of our favorite annual homecoming events! Friday, October 12, 2018 starting at 5 p.m.
Tailgate with Crusader alumni, family and friends from 5:00-7:00 PM in our new location in the TC Cafeteria. Enjoy a TC tailgate cookout featuring grilled hamburgers or hotdogs, baked beans, garden salad, potato salad and drink. For the future Crusader (kids), we will have a bounce house and Crusader face tattoos. The Kona Ice Truck will also be on hand selling delicious frozen treats! Tours of the campus will also be available. Meal tickets are $15 each and can be purchased at the TC Ticket Booth. A combo package of a meal ticket and game ticket is $20. Click button to purchase cookout meal ticket or a combo meal/game ticket. Buy Your Tailgate Only or Combo Ticket Now! Meal only: cost is $15 per person. Meal & Game Combo: cost $20 per person. Purchase now at the TC TicketBooth. Then march out to Crusader Stadium to watch the 2018 Homecoming Football Game as the Crusaders square off against the Cypress Creek High School Coyotes. Kickoff at 7:00PM. Homecoming Queen and King and their Court will be announced at halftime. 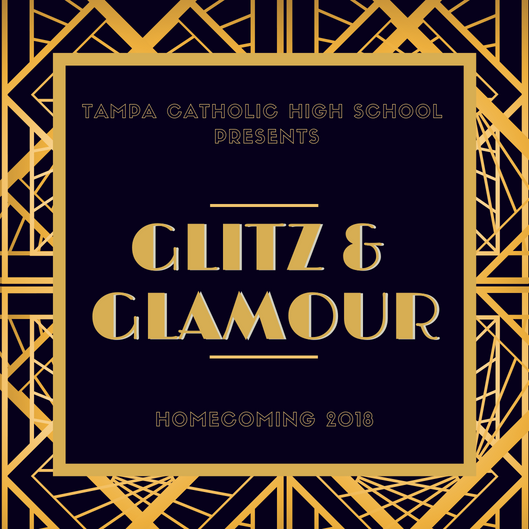 The Glitz and Glamour Homecoming dance will be held at the Tampa Airport Marriott on Saturday October, 13th, starting at 8:00pm. Be sure to invite your BFF or find a creative way to invite your date. Tickets will be sold online starting this Wednesday, September 26th and will conclude on Wednesday, October 10th. The first 150 ticket purchased will be sold at $35 and all remain tickets will be sold at $45. Directions and links to purchase homecoming tickets can be found HERE. Crusaders Wait 43 Years for First Real Homecoming! Every fall, schools from Washington, DC, to California call their former students back to campus to reunite the far-flung members of their extended families. It is a tradition called Homecoming. Tampa Catholic has celebrated Homecoming since its early football teams began playing in the 1960's. Unfortunately, the team was never able to play its Homecoming game, or any games at home. 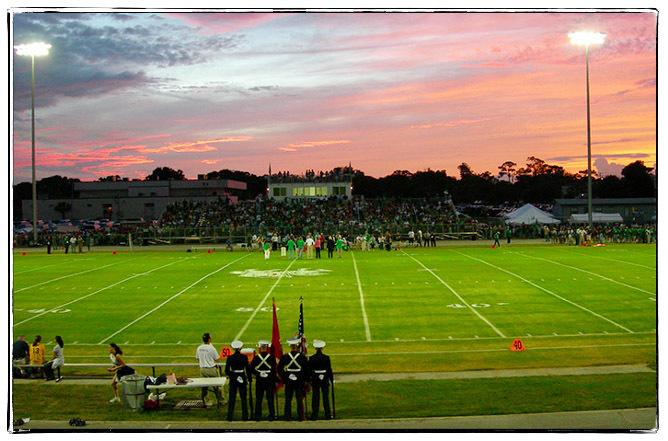 Even without a stadium on the campus, the Crusader faithful made wherever they played their home games their field and Crusader Spirit was famous in the Tampa area. After forty years of nomadic existence, the modern era of Crusader Homecoming began in 2005 when Tampa Catholic played it first home game and Homecoming in their new stadium. This marked the culmination of a nearly twenty year quest to obtain permission from the City of Tampa to raise funds and build the facility. Finally, all of TC's children could "Come Home to Rome". On October 21, 2005, undaunted by impending hurricane Wilma, an overflow crowd watched the Crusaders defeat Admiral Farragut Academy 27-7 for their first homecoming game at home and first-ever home win. Today, Crusader students, alumni and their families enjoy the electric atmosphere of Crusader home games in Crusader Stadium. Homecoming is a time when all Crusaders can now cheer their team on to victory in a home environment.